After my semi-secret mission to Paris lask week to the Guerlain factory, where I and other Beauty Editors swore – and signed – to keep the secret, the brand revealed today on its Instagram that Angelina Jolie is the new muse and ambassador, for the new perfume Mon Guerlain (it will be available in March). I was dying to tell you all the news (the lucky ones who were keeping up with me on Instagram that day saw some details of the super Guerlain event), but I was forbidden by the brand to even say a simple “it starts with an A”. The surprise was huge, Angelina Jolie was the most unexpected of names and nothing gave a hint that not only the brand would choose her, but also that she would accept what is her first contract with a Beauty brand. In a world where it seems that muses are picked by their number of followers on Instagram, Guerlain came to make it clear that, when you reach a certain point, those things don’t matter. The symbol that is Jolie puts any “influencer” of millions in a corner and the pick was a bold move, since the actress has an openly challenging personality and, at times, even controversial. This news, that comes in a time when the actress is living a difficult personal moment (if you want gossip go look somewhere else ;)) is a very positive thing and, in my opinion, has all the right ingredients to make Mon Guerlain a strong player in the market of perfumes that were released recently or will be in 2017. Stay alert to the 1 minute film that advertises the perfume and will soon be released by the brand, directed by Terrence Mallik with a strong association to Jolie, that looks stunning and makes us all wish to be like her: stong, fragile, seductive, delicate, mysterious… I loved the clip. More details about the news on VOGUE.pt (for example, Jolie will donate ALL the value of the contract to her charity actions) , and look out for the next issues of VOGUE when I’ll be able to unveil a bit more about this new perfume, with an iconic bottle that follows the brands style. 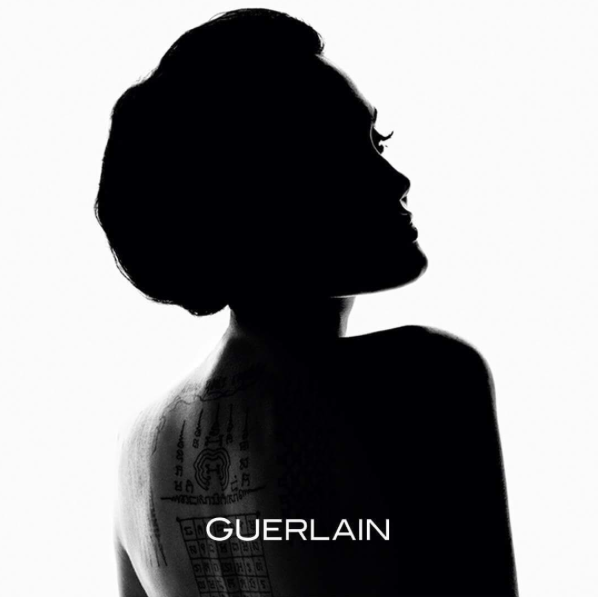 Besides Angelina Jolie, who were – or are, other Guerlain Muses? Now that the veil was lifted, I did a round-up of the muses that came before her, so you can see how Jolie not only fits like a glove, but also embodies the luxurious Guerlain look. Lucie de la Falaise – Niece to the iconic Loulou de la Falaise, Lucie was the face of the 1994 campaign of Jicky, the first ever unisex perfume, created in 1889 by Aimé Guerlain. Sophie Marceau – In 1998, the french actress and Bond Girl was muse of Champs-Élyssés, a fragrance inspired by the prestige and influence of the parisian avenue. Shalom Harlow – The canadian model and actress was the face of the iconic perfume Shalimar, in 1999. Hilary Swank – In 2006, I interviewed Hilary for VOGUE. The actress was chosen to be the face of Insolence, a fruty floral fragrance with notes of violet and iris, and bottle created by sculptor Serge Mansau. This was also the first Guerlain perfume to include berries in its composition. Nora Arnezeder – The french actress borrowed her Beauty to the maison in 2009, as face of Idylle. Anna Selezneva – In 2010, the model was the nymph of Aqua Allegoria. Natalia Vodianova – The russian model has signed several campaigns for Guerlain and, eight years ago, as the face of Shalimar, a sensual and mysterious fragrance, inspired by the love between Slah Jahan and Mumtaz Mahal. Recently, “Supernova” signed a limited edition makeup collection with Olivier Echaudmaison, creative director of the maison. The collection has the same name of the iconic perfume, as a tribute to her conncetion with the fragrance.